White Chicken Lasagna Rolls Recipe — Pip and Ebby - easy, delicious recipes! 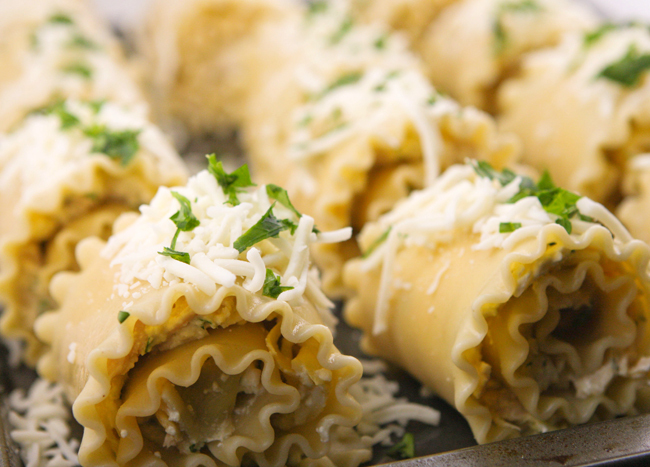 If you love lasagna, you’ll love these White Chicken Lasagna Rolls! Everything you love about lasagna but just a little more fun. Lots of flavor rolled into the pasta with four kinds of cheese makes a creamy, irresistible sauce! Easy to make, delicious to eat! I lied. I told you my next post would be about something that went along with my unhealthy holiday trend. That didn't happen! It's next, though, I promise. In the meantime, I present to you a variation of one of my favorite lasagna recipes. This is a fun alternative to typical lasagna. Lasagna turned inside out, if you will! I hope you all had a Merry Christmas! My boys and I have had a lovely week so far. Lots of presents and love. Sassiness, too, but mostly love. Preheat your oven to 350 degrees F. Coat a large rimmed baking sheet with cooking spray and set aside. Bring a large saucepan of water to a boil. Cook 12 lasagna noodles 3 minutes short of the package instructions. Drain and rinse. Set aside. Set the cooked lasagna noodles on a flat surface and divide the cheese mixture among them, spreading evenly across the surace of the noodles. Tightly roll up the noodles and place them seam side down onto the prepared baking sheet. Sprinkle with another 1/2 cup of shredded mozzarella cheese and chopped parsley. Bake in the preheated oven for 15 minutes, or until the cheese mixture is heated through. Enjoy, friends! Merry Christmas to you all!